What is United by Diversity? A multiyear focus with the goal of being more deliberate in deepening our conversations to cultivate greater respect, understanding, and celebration of our differences across our community. Instruction that is centered on education for justice, intellectual formation that develops abilities in students to reason reflectively, logically, and critically. Creating “men for others” by providing students with intellectual, moral, and spiritual formation that will enable them to make a commitment to service and agents of change. Develop courses in cross-cultural communication and cultural competency. These courses focus on helping students look through the “lens” of another person when it comes to different social identities as contained in the School’s Equality of Action Statement of Purpose--race, culture, ethnicity, gender, sexual orientation, religion, belief, age, economic status, or disability. Develop programming that provides learning opportunities both inside and outside the classroom for students, parents, faculty, staff and alumni. Possible programs include speakers and “lunch and learns”. Assist with the effort to recruit faculty, staff and students of diverse and varied backgrounds. Provide professional development to faculty and staff around cross-cultural communication and cultural competency. Work with student organizations that have diversity, justice and inclusion as part of their mission and work. The student organization, Diversity Union, empowers students to educate and challenge themselves on issues regarding inclusion, opportunity and justice. Students, faculty and staff are encouraged to visit the Office of Multicultural and Inclusion Initiatives located within the Counseling Office on Wednesdays during periods 4-6. Safe Spaces is a place in which students are able to discuss inclusion and discrimination issues based on race, culture, ethnicity, sexual orientation, religion, belief, age, economic status and ability. Appointments can be made for other days of the week with Tom Costello at thomas.costello@uofdjesuit.org. Kevin Boyle’s Arc of Justice depicts the racial turmoil in Detroit in 1925 through the story of Dr. Ossian Sweet, an African-American physician who faces murder charges after trying to defend his home in an all-white neighborhood from mob violence. In her book, Theoharis dispels the thinking that Mrs. Parks was a meek seamstress who with one act of defiance launched the Civil Rights Movement. In contrast to popular thinking, Mrs. Parks led a multi-decade life of rebellious advocacy against inequality and for employment and educational opportunities. After the Montgomery Bus Boycott, her worked moved North to Detroit where she continued her advocacy working for newly-elected Congressman John Conyers. This 2016 film depicts the story of Richard and Mildred Loving, a couple who was arrested for their interracial marriage in Virginia in the 1960s. The couple took their legal battle to the United States Supreme Court where the Court in 1967 upheld their right to marry as an interracial couple. Edited by James Melvin Washington this compilation of Dr. King’s most prolific speeches and sermons demonstrates his leadership and ability to move people to take up the baton of justice during the Civil Rights Movement. His sermon of November 6, 1956, “The Most Durable Power”, speaks of the “weapon of love” and how loves does conquer hate and bigotry. Dr. King still calls upon all of us to be “maladjusted” when it comes to discrimination and bigotry. His work is even more important for us today as a resource to fight for equity and justice. This 45-minute documentary produced by the Southern Poverty Law Center’s Teaching Tolerance program is the story of those courageous individuals who fought for voting rights for Blacks in the South. The film chronicles the history of the Voting Rights Act and combines actual footage from the times with interviews of those activists who fought the fight for Blacks to vote. It is an excellent resource for the classroom and can be ordered through the Southern Poverty Law Center. Selected by the New York Times as one of the best books of 2018, American Prison, examine the private prison industry through its author, Shane Bauer. Bauer goes undercover as an entry-level prison guard working for $9 an hour. Bauer knows prison life well as he spent time in an Iranian jail with two other Americans. He chronicles his work both with those incarcerated and the corrections officers who he works with on a daily basis. Bauer’s writing also describes how his own behavior changed over time due to his working in a prison environment. Ear Hustle brings you stories of life inside prison, shared and produced by those living in it. Earlonne Woods, incarcerated in San Quentin State Prison, serves as the host of the broadcast produced by Nigel Poor. The stories are difficult, sad, funny and insightful into the lives behind the walls of San Quentin. This semester’s Law, Justice & Culture class spoke by Skype with one of San Quentin’s prison chaplains, Fr. George Williams, S.J. Fr. Williams is featured in the episode, The Row, that deals with those sentenced to die. An additional note is that Governor Brown recently commuted the sentence of Earlonne Woods. The podcast will continue and will feature the life of Mr. Woods on the outside. Slavery by Another Name is based upon the Pulitzer Prize-winning book by Wall Street Journal reporter, Douglas Blackmon. It is a documentary that challenges the belief that slavery ended after the Civil War. The film tells the story of how involuntary servitude continued to enslave men of color and how it is reflected today in our system of incarceration. Princeton sociologist, Matthew Desmond, reports on the poorest neighborhoods in Milwaukee. A city that is also one of the most segregated cities in America. Desmond tells the stories of eight families who on a day-to-day basis are on the brink of losing their housing. The alternatives are living in shelters, on a couch with friends or living on the streets. Desmond also examines the business practices of two landlords and their dealings with their tenants. The book demonstrates the importance of decent affordable housing and the consequences of not having it. After all, housing affects how you live and if you live. Housing is the foundation for where your children attend school, reliable public transportation and access to quality health care. The 1998 Spike Lee documentary film tells the story of the September 15, 1963 church bombing at 16th Street Baptist Church that killed four young girls, Denise McNair, Carole Robertson, Cynthia Wesley and Addie Mae Collins. The documentary is filled with actual film footage from that time, family photographs and interviews with the girls’ families. The film contains interviews with Reverend Jesse Jackson, Mrs. Coretta Scott King, Andrew Young and a rare interview with former Governor of Alabama, George Wallace. This Clint Eastwood directed film is set in the Detroit-Grosse Pointe Park area and features St. Ambrose Catholic Church in many of the scenes. Eastwood also plays retired auto worker and Korean War vet Walt Kowalski. Walt is a better, aging man who sees his neighborhood changing with an influx of people from the Hmong community. Walt fills emptiness in his life with beer and home repair, despising the many Asian, Latino and black families in his neighborhood. Walt becomes a reluctant hero when he stands up to the gangbangers who tried to force an Asian teen to steal Walt's treasured car. An unlikely friendship develops between Walt and the teen, as he learns he has more in common with his neighbors than he thought. He begins to see God in everyone and Walt becomes an ally and advocate for his neighbors. The film is about truth, reconciliation and redemption for Walt. Watch the trailer for the film below. September’s books focus on the racial history of Detroit and how history impacts our current regional segregation today. The first book is Thomas J. Sugrue’s, Origins of the Urban Crisis: Race and Inequity in Postwar Detroit (2005) and the second book is Kevin Boyle’s, Arc of Justice (2004), that takes the reader through the 1925 trial of Dr. Ossian Sweet. Boyle, a professor at Northwestern University, tells the story of Dr. Ossian Sweet and his family as they moved into a home in an all-white neighborhood. Dr. Sweet, a grandson of a slave, was met with mob violence outside his home. When shots rang out, one of the whites in the mob threatening his family’s lives was accidentally killed. Clarence Darrow defended Dr. Sweet with great eloquence as he implored the jury to base their verdict on fairness and equality. The city has recently undertaken an effort to preserve the home of Dr. Sweet. The first Campus Conversation for the 2018-19 school year took place on September 13, 2018. Students from all grades participated in discussing how inclusive U of D Jesuit is to them. Students talked about how one’s social identity affects how others perceive them and include them. Their goal is to have a safe and respectful community. The discussion also focused on the importance of having an open and respectful discussion in the classroom on these issues and look to faculty to make this happen. The first Campus Conversation of the new semester took place on January 23. Diversity Union leaders, Eddie Black, Steve Murphy and Jerry Perret, facilitated a discussion on how socio-economic class divides us. Students pointed out how where you live defines how you live. Many of those who attended shared their own personal experiences. Students agreed that change is possible if they continue to bring awareness of topics related to class, wealth and poverty in our communities. Students from U of D Jesuit and Loyola High School met over lunch on December 13 to discuss issues related to religion and its importance in our school community, country and the world. Students also discussed the messages they received about religion while growing up and how the media plays a role in affecting our views on religion. The discussion also turned to what happens when we mix politics and religion in our dialogue. Students expressed a desire to learn more about other religions while students in high school. Leaders of Diversity Union held its monthly Campus Conversation on the topic of free speech, hate speech and hate groups. The discussion focused on what constitutes “hate speech” and “free speech”. Participants emphasized the importance of education and listening to what the other person has to say. While we may disagree on an issue, students felt that an honest and respectful discussion is needed. How one is socialized plays a large part in the views and memberships one holds in their lives. Students connected the discussion to U of D Jesuit’s mission and work of love, compassion and kinship. Students from U of D Jesuit, Loyola and Cristo Rey met this week to discuss inclusion issues at their schools. This month's meeting was hosted by students from Loyola - Hayden Caddell, Eric Cox II, Dayshawn Reed, and Kendall Wilson. KJ Wilson from Loyola led a discussion on how we all need to wear different "masks" as we go through the day at our schools, homes and communities. You might act a certain way at school and then another way with your friends when you get home. Students learned from each other the struggles in doing so and expressed how they just want to be themselves in all places. Our next meeting is December 13 at U of D Jesuit. On October 10, students from Loyola High School, Cristo Rey High School and University of Detroit Jesuit High School gathered for lunch and discussion at Cristo Rey. Students discussed the importance of their own social identities and how those identities factor into their socialization as young adults. The group meets three times this semester and three times next semester. Every school takes a turn in hosting the lunch meeting. The goal is to equip students with the tools to help them facilitate intergroup dialogue on issues of inclusion on their respective high school campuses. U-D Jesuit was represented by juniors, Eddie Black and Steve Murphy, and senior, Jerry Perret. What do we value at U of D Jesuit? How do we grow our culture? What are the barriers to inclusion? What do we need to do to break down those barriers? The discussion was thoughtful and engaging, and the leaders of Diversity Union left with a number of ideas and thoughts about inclusion, diversity and how we can break down what separates us. Brotherhood, companionship, diversity, faith, service and justice where mentioned as concepts we value at U of D Jesuit. Education, conversation and getting to know one another were discussed as ways to break down the barriers that separate us. Diversity Union plans to hold these campus conversations on a regular basis with the goal of making our community a more inclusive one. On April 6, U-D Jesuit’s student organization, Diversity Union, hosted its second annual Diversity Convention at the school. Students from five different local area high schools attended the Convention. Represented schools were: Cranbrook-Kingswood, Regina, Mercy, Detroit Cristo Rey, Loyola Detroit, Thurston and U of D Jesuit. Students participated in two workshops on stereotypes and immigration issues. After lunch, the entire group participated in a group activity involving different social identities. Students left with a sense of how to make their school communities more inclusive. On the weekend of March 28-31, students from ten different Jesuit high schools spent the weekend at Marygrove College exploring Detroit and its culture and history. Represented Jesuits schools were: St. Ignatius (Cleveland), Loyola Academy, St. Xavier, Rockhurst, St. Ignatius (San Francisco), Portland Jesuit, Loyola Detroit, St. Ignatius (Chicago) and Walsh Jesuit along with U of D Jesuit. Students toured the city by bus with a guided tour by Mr. Beldyga. The tour also included both local Jesuit high schools. 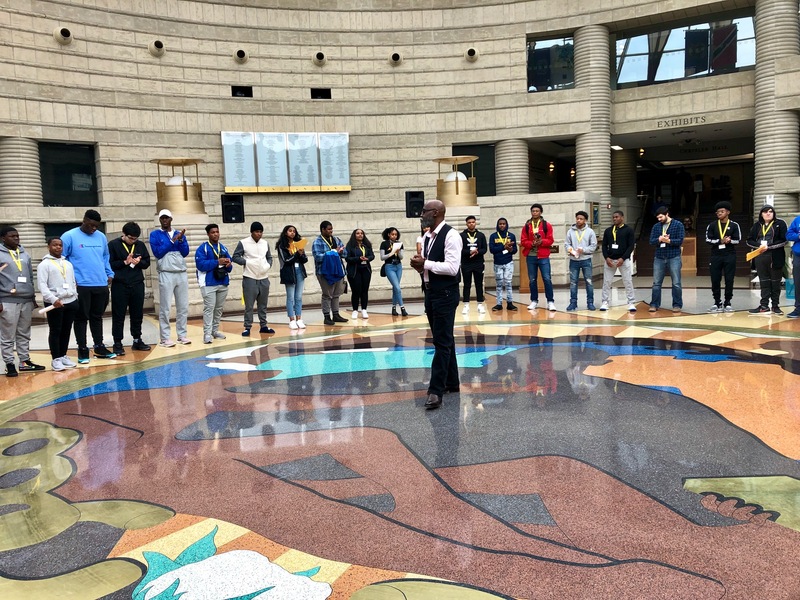 On Friday, students spent the afternoon at the Charles H. Wright Museum of African American History and watched the film, “The Hate U Give”, on Friday night. On Saturday, the group visited the American Muslim Center meeting with Imam Mardini and feasting on a Middle Eastern lunch. Saturday afternoon was spent at the Arab American national Museum followed by dinner provided by Fredi the Pizza Man. Student-led discussions focused on the history of Detroit and how its struggles impact its residents today. The Diversity Union’s mission and work is to educate our students about the different backgrounds and viewpoints of other students as well as allowing a bridge for communication among them. Our members strive to be open-minded and respectful of each other’s opinions and beliefs. Although our opinions may differ, our goal is to know each other better and learn from our fellow students by listening to each other. The club meets every Wednesday at 3 p.m. in room 003. Tom Costello '71 is the moderator. Teaching for Diversity and Social Justice, 2nd Ed. The majority of Costello's career was as the general counsel for Compuware Corporation for 24 years.